I Buy Way Too Many Records Dot Com: Record Store Day Haul #6: Masked Intruder - Incriminating Evidence 2011 Demo 7"
Record Store Day Haul #6: Masked Intruder - Incriminating Evidence 2011 Demo 7"
We're in murky territory again as far as this being a Record Store Day release. It came with a Record Store Day sticker on it, but it wasn't on the official list. I also didn't pick it up at a record store, it was available via Interpunk or through the label's website. I can't say for sure that it wasn't available at any actual record stores, but it seems to me that the bulk were sold online. Not that my enjoyment of the record is affected by any of that, I just question whether or not to count it as a Record Store Day release. I decided to. 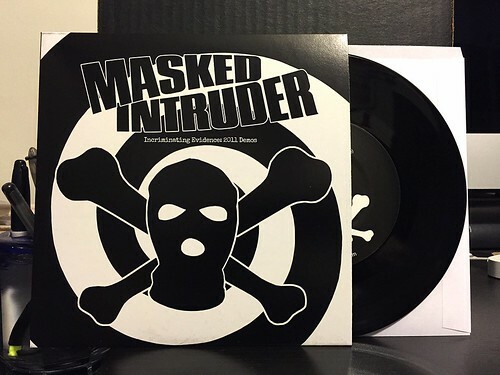 The four songs on this 7" comprise Masked Intruder's 2011 demo. It's an interesting peak into the band before they started riding a gigantic wave of momentum that took them all the way to Fat Wreck. Two of the songs on this demo ("How Do I Get To You" and "Unrequited Love") wound up on the band's first full length while one of them ("I Fought The Law") was held off until the second Masked Intruder album. I can't say any of these three songs sound that much different than the versions that ended up on their records. They certainly not recorded as well, but the basic song structure remained intact. One song ("I Plead The 5th") is exclusive to this 7" as far as I can tell. Maybe it ended up on a compilation or something, but I don't have it on any Masked Intruder records in my collection. It's a very short song that doesn't consist of much other than the repeating of the phrase "I Plead The 5th" over and over. It's not bad, but there's nothing all that special about it and I can see why it was never really used on any of the band's proper records. This isn't an essential 7" by any stretch of the imagination, but it's a neat listen. More than anything, it just feels like a collection completer to me. I have the rest of their releases, so I guess I need this one in the collection as well.